Fishermen of oysters from Essex are waiting to hear if a prized oyster variety is to be given special status. The Colchester Native oyster is only found in creeks around the River Colne. Local fishermen want the European Union to protect their delicacy from traders passing off inferior oysters under the same name. If successful the oyster will be one of only 34 UK specialities on the list, joining Jersey Royals and Newcastle Brown Ale. 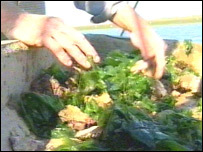 About 70 tonnes of the Colchester Native oyster are produced each year compared to 1,000 tonnes of the more common rock oyster. Suppliers want it to be given Protected Geographical Indication (PGI) by European Union officials in Brussels. It means the Colchester Native is recognised as a high-quality regional speciality that can only be produced in one area. Richard Haward, whose family has been farming oysters at West Mersea for more than 200 years, said the taste of the oyster depended on which area of sea it came from. "The Blackwater Estuary (of the River Colne) is supposed to be the second most salty river in the country so they are very salty oysters. "But it is not only the taste - it's the texture of the flesh which is very fat and plump," he said. The area has been renowned for its oysters ever since Roman times. Colchester councillor Kevin Bentley said the town was very famous for the oyster and was very proud of the delicacy. "It is one of the finest oysters in the world and in the some of the finest restaurants in the world you will find the Colchester Native." Local oystermen should know before the end of the season whether their prized product will get its special status.